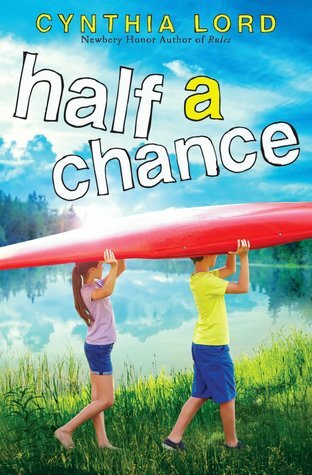 Half a Chance is told by Lucy, a tween-age girl who has just moved to a small town in New Hampshire. Having moved several times before, she is understandably worried about new and unfamiliar places and people–especially finding friends her own age. Lucy’s new home is situated on a lake and she almost immediately meets Nate next door. She is disappointed to find out he is only there for the summer at his grandmother’s cottage but enjoys spending time with him and his family. Half a Chance has rocketed to the top of my Summer Reads list! Lucy and her story encompass so many things that are dear to my heart. Like Patricia Reilly Giff’s Pictures of Hollis Woods the title character often shows us how to see the people and things around us through the eyes of the visual arts–in this case photography. Lucy’s father is a famous photographer and she is at the beginning of finding herself in the art of photography as well, although she hasn’t yet shared this with her father. Photography is both a way of sharing herself with the world and of holding her feelings and her circumstances at arm’s length. Before he leaves on his current expedition to Arizona Lucy discovers that he will be judging a photography contest for kids. Although she knows it’s a conflict of interest for her to enter she is determined to do so in order to get her father to notice her work…and her. …weigh the effect the photo could have on that one person against the bigger story. Maybe the photo is art? Or news? Or it’s a photo that will change people’s minds about something important. Important things are always complicated, and that’s what makes them hard. But it’s also what makes them matter…. At some point, you just have to choose. And then be brave enough to stand up to the people who think you made the wrong choice. These words sum up so much about what it means to create and share art AND what it means to move forward in life. Don’t ever choose the people who don’t matter over the ones who do. Sweet, sad and inspiring Half a Chance is a worthwhile read particularly for 6th -9th graders who will identify with Lucy’s longing, confusion and earnest efforts to make a difference–however small–to those she loves.